First they said that they were killed by gunmen, then it was that they were killed by Mexican troops and they were sorry, and now they say they were killed by criminals afterall. A joint investigation by Mexican military and civilian prosecutors concluded that drug-cartel gunmen, not soldiers, were responsible for the deaths of two children during a confrontation in the northern state of Tamaulipas, officials said here Friday. The youngsters were killed April 3 on the road linking the towns of Nueva Ciudad Guerrero and Ciudad Mier, where a family of 13 traveling in an SUV was caught in a crossfire between troops and gunmen. Bryan and Martin Almanza Salazar, ages 5 and 9, were killed and seven other family members wounded. The survivors blamed the military, saying that the troops opened fire without provocation. The SUV in which the family was travelling on during the attack. The impacts from bullets and grende can be seen on the rear of he vehicle. At a press briefing Friday in Mexico City, the chief military prosecutor, Gen. Jose Luis Chavez Garcia, said the soldiers went to the road in Tamaulipas based on an anonymous tip about a battle between rival criminal groups. Finding six bullet-riddled SUVs abandoned at the scene, the troops continued down the road until they encountered a convoy of seven SUVs traveling in the opposite direction, whose occupants opened fire on the soldiers. Four of the seven SUVs fled and the Almanza Salazar family’s vehicle ended up between two other vehicles carrying gunmen, Gen. Chavez said. 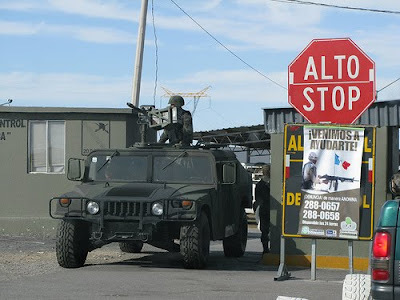 According to an official news release issued today by Notimex , Mexico’s Defense Ministry (Sedena) has concluded that the 2 children allegedly shot and killed by the Mexican army at a checkpoint in the outskirts of Nuevo Laredo, Tamaulipas on April 3, 2010 were in fact caught in a crossfire during an altercation between army troops and cartel gunmen. The news release states that Martin and Bryan Almanza Salazar were killed by shrapnel wounds inflicted by 40 mm fragmentation grenades that are not issued to Mexican army personnel and that the soldiers at the checkpoint did not have these weapons at their disposal. This statement, in effect, blames cartel gunmen for the children’s death. Here is the press release issued by Notimex. However there is a problem with this version of events. Either the Sedena investigators are inept or there is a deliberate attempt to coverup certain facts. Here is visual evidence that 40mm grenades are in fact issued to Mexican army personnel. Why is Sedena denying the fact that this weapon is issued to the army? It is true that this weapon is also used by cartel forces but this denial by Sedena, who is responsible for knowing what weapons are issued to the army, puts the results of the investigation into very serious doubt. Arizona deputy wounded in desert shootout found. Arizona State, US - A sheriff's deputy was shot and wounded Friday after encountering a group of suspected illegal immigrants who apparently had been hauling bales of marijuana along a major smuggling corridor in the Arizona desert — a violent episode that comes amid a heated national debate over immigration. State and federal law enforcement agencies deployed helicopters and scores of officers in pursuit of the suspects after the deputy was shot with an AK-47 on Friday afternoon. The officer had a chunk of skin torn from just above his left kidney, but the wound was not serious and he was doing fine. The shooting was likely to add fuel to an already fiery national debate sparked last week by the signing of an Arizona law aimed at cracking down on illegal immigration in the state. The deputy was found in the desert Friday afternoon — after a frantic hourlong search — suffering from a gunshot wound from an AK-47, Pinal County sheriff's Lt. Tamatha Villar said. He was flown by helicopter to a hospital in Casa Grande, about 40 miles south of Phoenix. Villar said the deputy had been performing smuggling interdiction work before finding the bales of marijuana and encountering the five suspected illegal immigrants, two armed with rifles. Oaxaca - Two journalists missing since an attack this week on a caravan of human rights activists in the southern Mexico state of Oaxaca were rescued by police from the spot where they hid from the assailants. Reporter Erika Ramirez and photographer David Cilia, who had a gunshot wound, were located 11:00 p.m. Thursday and taken to the city of Santiago Juxtlahuaca, where they were met by family and colleagues before being admitted to the municipal hospital, regional prosecutor Wilfrido Almaraz said. With support from a helicopter, some 80 Oaxaca state police set out Thursday afternoon to search for Ramirez and Cilia around the community of San Juan Copala, the intended destination of the ambushed convoy. 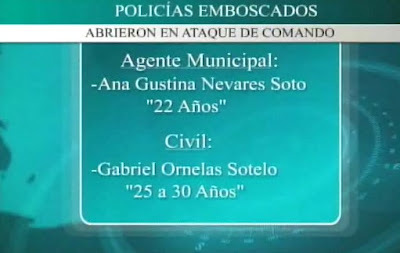 The police operation followed public complaints by the pair’s boss, Contralinea magazine editor Miguel Badillo, that authorities were doing nothing to find the missing journalists. Four vehicles carrying some 40 people were ambushed Tuesday while on a mission to deliver food to residents besieged in San Juan Copala, 300 kilometers (186 miles) west of Oaxaca city, the state capital. Two people, Beatriz Alberta Cariño Trujillo and Finnish national Jyri Antero Jaakkola, were killed in the attack, while another activist was wounded. Ramirez, Cilia and two other journalists, David Venegas and Noe Bautista, were reported missing. Miguel Aleman, Tamaulipas — Three people were found dead Thursday morning, including a man and woman found shot to death inside a vehicle along a rural highway, police said. 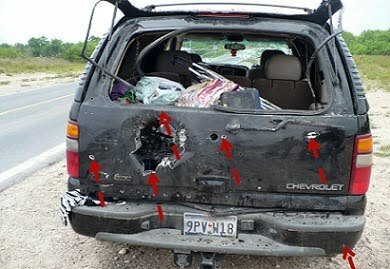 Tamaulipas state police said a man and a woman were found shot to death in a vehicle near the 83 kilometer mark along Mexico Highway 2 — the primary route that connects border cities south of the Rio Grande. Another man was found dead in Los Guerra, a small community just west of Miguel Alemán, police said. The fatalities come amid a recent streak of grenade attacks in Reynosa, where several incidents occurred late Wednesday night and early Thursday morning. 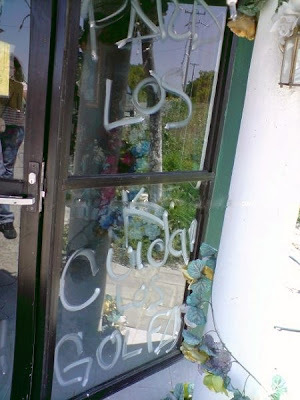 State police said one of the grenades exploded near a municipal police installation in the area also known as la zona de tolerancia, or, “the tolerance zone,” a district in the city open to prostitution and narcotics use where visitors pay an entrance fee. Commonly known as Boys Town, the red-light district is located on Reynosa’s north side, west of the city’s downtown. At least 40 Mexican migrants who were traveling in a bus from the central state of San Luis Potosi to the United States have been missing for more than a month, a lawmaker said. Fernando Rocha, a legislator in the neighboring state of Queretaro, told Efe that the bus left the town of Xilitla on March 17 en route for Texas and Florida, where the emigrants had pre-arranged jobs waiting for them. Most of the people on the bus were from San Luis Potosi and Queretaro, and among them were several minors, said Rocha, who added that there were no women on board. Rocha said that relatives of the missing men, after they received no word from their loved ones for a time, decided to report the situation to the public prosecutor’s office in Ciudad Valles, near the town from where the bus had departed. The lawmaker added that two other buses with migrant workers on board that left from the area, known as Sierra Gorda, heading for the United States also are missing, but the number of people who were traveling on those vehicles is not known. To explore this view Borderland Beat presents to you a glimpse into the mechanisms of the illegal drug market in the United States. The person interviewed is an active participant in a criminal enterprise. He was plain spoken with a confidence bordering on arrogance. His appearance designed to not attract attention. A skill acquired through experience, he said. He blended in but the power he spoke of was very evident. He was visibly excited as he spoke, it was quite evident he loves what he does. Vehicle of Missing Mexican Journalists Found Riddled with Bullets. Oaxaca - The car carrying two journalists missing since an attack two days ago on a caravan of human rights activists in the southern Mexico state of Oaxaca was found riddled with bullets, the reporters’ boss said Thursday. “The car of our comrade reporters has more than 30 bullet impacts,” Contralinea magazine editor Miguel Badillo told a radio station in Mexico City, complaining that state and federal authorities are doing nothing to find his missing employees. Four vehicles carrying some 40 people were ambushed Tuesday while on a mission to deliver food to residents besieged in San Juan Copala, located some 300 kilometers (186 miles) west of Oaxaca city, the state capital. Two people, Beatriz Alberta Cariño Trujillo and Finnish national Jyri Antero Jaakkola, were killed in the attack, while another activist was wounded and at least four people remain missing. The editor said he and the families of Contralinea reporter Erika Ramirez and photographer David Cilia were “very worried” about their safety. Mayor of Indian descend from the southern Mexican state of Guerrero in Zapotitlán Tablas, José Santiago Agustino, was executed Thursday by an unknown assailants. The tlapaneco mayor was leaving a restaurant in a market place in Chilpancingo, the capital of Guerrero, at which time an individual shot him at close range and managed to flee. "Santiago Agustino was walking to his car along with a group of staffers when he was intercepted by a stranger in the parking lot," said Bonifacio Montufar, director of the Municipal Police of Chilpancingo. The mayor belonged to the Partido Revolucionario Institucional (PRI) and last January he had completed one year in office. Warning: Graphic Content, Discretion is advised. 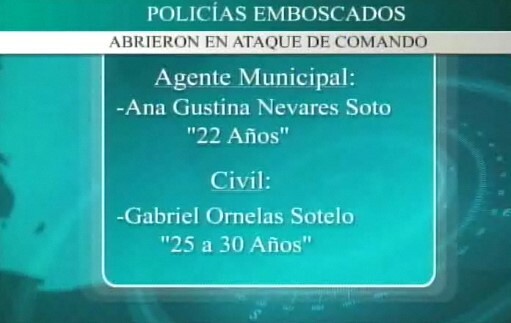 I am posting some photographs of some alleged Zetas that were abducted (levantados) in Camargo and Miguel Aleman. These are presumed Zetas as most have the letter "Z" carved on thir bodies. 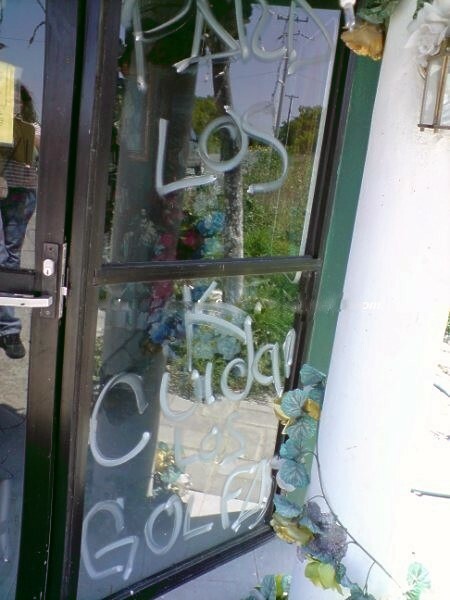 Some say this is the work of the Gulf cartel, but we have not confirmed it. They were dismembered and decapitated. I must warn you, these images are strong and discretion is definitely advised. 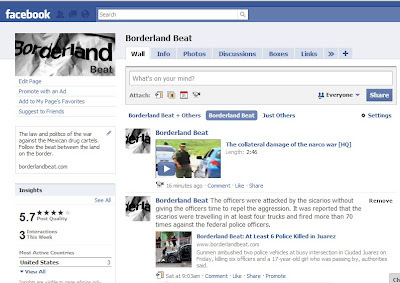 I will post the most violent images on the subsequent page. If you get offended while viewing images depicting extreme violence, please do not view. I post these images to give the people an idea of the extent of brutality these cartels go through when they want to send their message. Many times we get complacent and dismiss the extent of the reality that is taking place, but the horror is real. This is the kind of nightmare the people in Mexico live with on a routine basis. WARNING! Graphic images depicting extreme violence. Despite the fact that President Felipe Calderon has sent over 5,000 federal police officers to Ciudad Juarez, the violence continues at a record pace. At least 15 people have been killed within the last 24 hours, among the dead are six teenagers, in various violent acts in Ciudad Juarez which borders the United States. It seems like the more federal police they send, violence just increases, nothing changes in this criminally torn city. 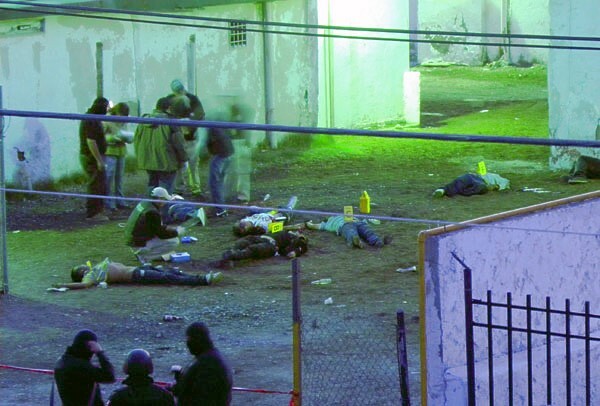 People continue to be executed at all hours of the day in Juarez, and we see some of the low level sicarios get arrested, but what we don’t see is the arrest of the heavy weights, they remain immune. Ciudad Juarez, Chihuahua - Shortly after four o'clock in the morning 8 people that were in the bar "Aristos" located on Avenida Vicente Guerrero and Honduras in the community of El Barreal in Ciudad Juarez were shot dead. Gunmen (sicarios) entered into the bar and took the eight people into the back yard where they were then placed against a wall and executed. The sicarios then walked next to each body and shot each one of them point blank on the head "coup de grace or tiro de gracia" style. Authorities have mounted a huge police deployment throughout the city in search of those responsible, unofficially it is said that several people were injured and taken to different hospitals in the city. Police found 12 spent casings and a 1990 Chevrolet Blazer, which apparently belong to the people massacred, said Arturo Sandoval, spokesman for Chihuahua state police. Several customers and employees were apparently traumatized and were terrified after witnessing the bloody massacre. Hermosillo, Sonora - At around past six last Monday Mrs. Clara Elena Laborín Archuleta,supposed wife of Capo Hector Beltran Leyva, known as "El Hache," was left on the sidewalk of the streets of De la Reforma and Luis Donaldo Colosio, right next to the University of Sonora, with her hands and feet tied and her head wrapped with a piece of cloth up to her nose. A white cardboard was left on top of her with a narco message, she had been left by unknown sicarios driving a gray sedan. It is said the men fled the scene at a high rate of speed on the street De la Reforma while shooting several shots, but police authorities at the scene were unable to find any spent casings. On April 23, 2010 Mrs. Laborín Archuleta had been abducted (levanton) at her residence outside the streets of Del Paseo and Juan Navarrete, in the community of La Alameda, not far from the headquarters of the Sonora State Preventive Police. Alleged drug lord extradited to Texas after eight year fight to stay in Mexico. The alleged head of a Mexican drug trafficking enterprise lost his eight-year battle to stop extradtion to the United States to face charges. Juan Jose Quintero-Payan, 68, of Guadalajara, Jalisco, Mexico, has been extradited to Texas to face four felony charges for drug and racketeering. U.S Attorneys José Angel Moreno and John E. Murphy and Zoran Yankovich, special agent of the Drug Enforcement Administration, announced the extradition on April 28, 2010. A San Antonio grand jury indicted Quintero, and a provisional arrest warrant was issued, in 2002. Quintero was ordered on April 26, 2010 by U.S. Magistrate Judge Pamela A. Mathy in San Antonio to remain in federal custody without bond pending further criminal proceedings. 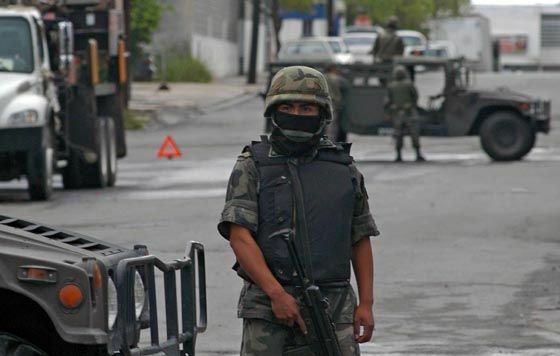 Acapulco, Guerrero - Marines and federal law enforcement agents arrested 25 police officers, including three command-level officers, in Acapulco, a city in the Mexican Pacific state of Guerrero, but officials did not say why the officers were detained. Guerrero Gov. Zeferino Torreblanca confirmed that the officers were arrested, but he did not provide any details, saying only that his government would not tolerate actions that violated the law. The municipal police officers were taken to the 8th Naval Zone facility in Acapulco. The officers were detained when they arrived early Tuesday at the residence of Acapulco city council secretary-general Vicente Trujillo Sandoval in response to a supposed shooting report. The officers’ relatives went to the 8th Naval Zone base to request information about their cases. Carmen Nicolas Camacho and Ema Luna Garcia, the mothers of officers Eduardo Jimenez Nicolas and Javier Luna, respectively, said their sons were mistreated by the marines and they planned to file a complaint with the Human Rights Commission. More "Fun in the Mexican Sun" as the Mexican DTO's and Narco Traficantes wreak havoc across the border. According to Mexico's former President Vicente Fox , the U.S.bares the full blunt of responsible for all of Mexico's problems including the illegal and controversial gun trade. President Fox continues to mouth off ans point finger "Blaming the Other Guy" for Mexico's systemic corruption. The fact is narco trafficking and violence was at a high point during his term in office and went unchecked by the fedreal government, culminating to what we see now. Old video, except the Zetas are now rival enemies with the Gulf cartel after becoming a full fledge cartel, isntead of at arm wing of the CDG. Relatives of two killed bodyguards cry during their funeral in Morelia April 25, 2010. Two bodyguards who were part of a police team and two civilians were killed and at least eight people injured, including Michoacan State Secretary of Public Security Minerva Bautista Gomez, in an attack by hitmen on Bautista Gomez's convoy last Friday, local media reported. State of Michoacan - More than 2,700 large-caliber rounds were fired in last weekend’s failed attempt on the life of the public safety secretary of the western Mexican state of Michoacan, state official Fidel Calderon said. 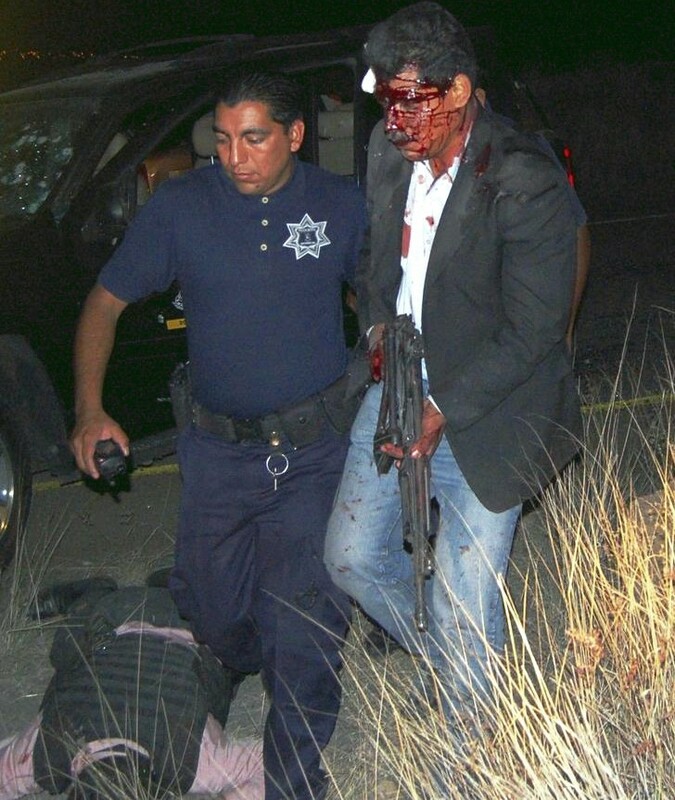 An injured bodyguard of State Secretary of Public Security Minerva Bautista Gomez is being taken away after a shoot-out in Morelia April 24, 2010. Bautista Gomez was seriously injured, two of her bodyguards and two civilians killed and at least eight people injured in an attack by hitmen who had previously blocked the road with a trailer truck, according to local media. The secretary and her bodyguards were attacked early Saturday on a highway in Michoacan that was blocked with a trailer by the hit squad. Monterrey, Nuevo Leon - Army troops rescued a total of 23 kidnapping victims after clashes with gunmen in the northern state of Nuevo Leon, the Mexican military said Tuesday. A spokesman for the 7th Military Zone told the press that two gunmen were killed Tuesday during a battle on a ranch near the town of Sabinas Hidalgo, located about 100 kilometers (60 miles) north of Monterrey, the state capital. Among the 16 captives discovered at the ranch were a woman and a 3-year-old child, the spokesman said, adding that several of the captors managed to escape the military operation, which included helicopters. Crumbling of alliance between two drug gangs has plunged 200-mile stretch of border into bloodshed. Reynosa, Tamaulipas — This border city had escaped the worst of Mexico's bloody drug war for years, but now the bodies are piling up and its once-busy streets are empty after dark. The crumbling of an alliance between two drug gangs has plunged the 200-mile stretch of border into violence, raising fears of a new front in the drug war, a U.S. anti-drug official said. In Mexican border cities stretching from Matamoros to Nuevo Laredo, gunfire has been heard almost daily, and at least 49 people have been killed in drug war-related violence in less than six weeks. Reynosa's main plaza and Calle Hidalgo, a pedestrian shopping street, still bustle during the day. Shoeshiners were doing brisk business on a recent afternoon in the city across the Rio Grande from McAllen. But the streets are deserted by evening, clothing store manager Manuel Diaz said. "I imagine they are scared, because there are no customers in the street," he said. Diaz kept his children home from school last month when rumors of abductions terrorized parents and many schools suspended classes. Homicides in the Juárez drug war will soon surpass the 5,000 mark as a vicious conflict continues. As of Sunday evening, there have been more than 760 murders this year, raising to 4,992 homicides in the Juárez area since 2008 when a drug cartel war erupted, according to a tally kept by the El Paso Times. 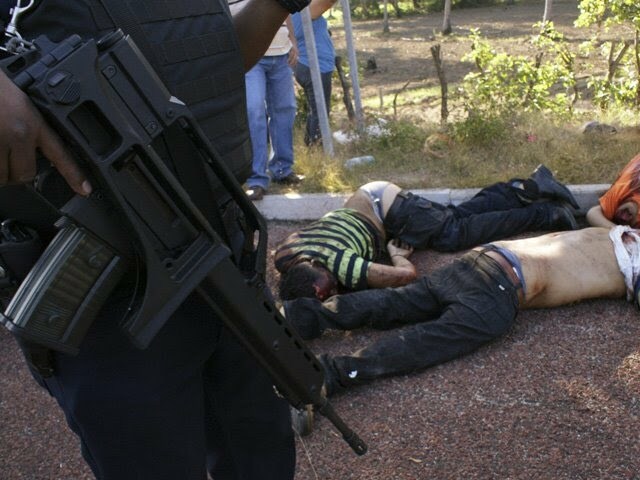 The war between the Sinaloa and Juárez drug cartels that began in January 2008 sparked an unprecedented wave of murder, including daytime street shootings, mutilations and massacres. By comparison, the number of deaths in Juárez surpasses the 4,393 members of the U.S. military who have died in the Iraq war since 2003. The killings in Juárez have been unrelenting. On Saturday night, gunmen burst into a funeral vigil for a slain teenager and opened fire, killing three women and wounding 10 others at a house in the Independencia 2 colonia in the southern part of Juárez. Chihuahua state police said the shooters fired 44 rounds. Police identified the dead as Maria del Carmen Rangel Chacon, 65, Sara Orosco Rangel, 46, and Ernestina Rubio Martinez, who was 55 to 60 years old. State of Tamaulipas – Five suspected gunmen died in a shootout with army troops at a ranch near the border between the northern Mexican states of Nuevo Leon and Tamaulipas, military spokesmen said. 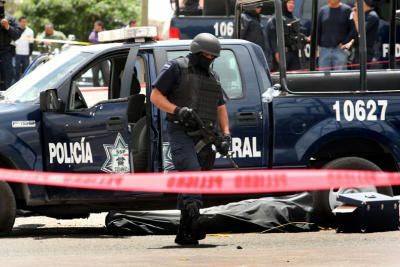 The shootout occurred Monday in an area near the U.S. border, where the Los Zetas cartel had taken over a ranch to train its gunmen. 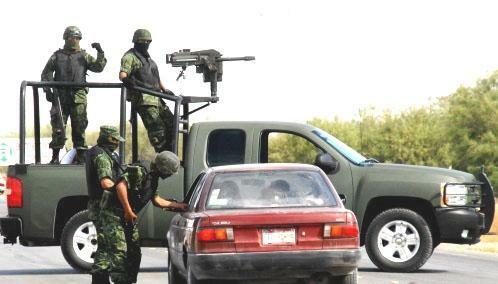 Several drug cartels have been fighting for control of Nuevo Leon and Tamaulipas states. Los Zetas evicted the owner of the El Puerto ranch, located between the cities of General Bravo and Doctor Coss, turning the property into a training center for hitmen. The gunmen opened fire on the soldiers as soon as they arrived at the ranch. The troops returned fire, killing five suspected gunmen. An undetermined number of gunmen managed to get away even though the army pursued them with support from two helicopters. Soldiers found several rifles and an unspecified quantity of drugs at the ranch. Authorities Still Looking For Several Other Suspects. A joint operation between the Mexican army, the Chihuahua State Attorney General, and the Mexican Attorney General's office led to the arrest of one of the men who allegedly participated in the kidnapping and murder of several American citizens in Chihuahua. Authorities said the offices of the state attorney general in Nuevas Casas Grandes received an anonymous tip on the whereabouts of Ubaldo Ivan Rohan Nunez. 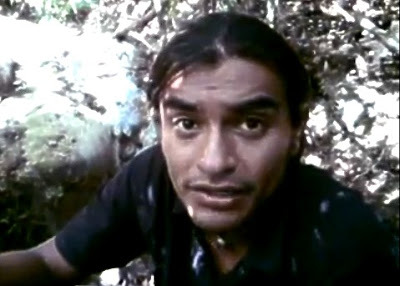 After he was arrested, Nunez confessed that he was a member of the Juarez Drug Cartel. 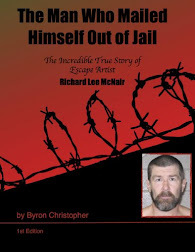 Nunez also said that he participated in the kidnapping of Erick Lebaron Ray on July 7, 2009; as well as the kidnapping of Benjamin Lebaron Ray and Luis Carlos Whitman Stubbs on May 2, 2009. Benjamin Lebaron and Stubbs were later found dead by authorities. The kidnappings took place in the town of Lebaron, which is within the municipality of Galeana, Chihuahua. At the time of his arrest, Nunez was allegedly in possession of an automatic assault rifle that only the Mexican Federal Police and the Mexican armed forces are allowed to carry. 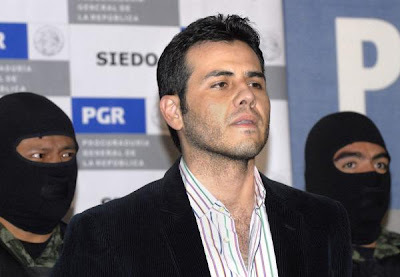 Nunez told investigators that he would sell cocaine for the Juarez Cartel in the town of San Buenaventura with the help of his uncle, Jaime Gonzalez-Pinon, who also worked for Juarez Drug Cartel. Ciudad Juarez, Chihuahua - Six people, including three attending a wake, were killed in Ciudad Juarez, Mexico’s murder capital, the Chihuahua state Attorney General’s Office said. Gunmen burst into a house Saturday night in the Independencia neighborhood and opened fire on a group of people holding a wake. Three women died in the attack and 12 other people were wounded, the AG’s office said. Several of the wounded are listed in serious condition at hospitals in Ciudad Juarez, located across the border from El Paso, Texas, the press reported. Investigators found 44 bullet casings from 9 mm pistols inside the house, where a wake was being held for a man murdered in the town of Parral. Three other people were killed in separate incidents Saturday night in Ciudad Juarez, where more than 5,000 people have died in drug-related violence since 2008. Jose Luis Perez Ramirez, 25, was shot in the head in the Terrenos Nacionales neighborhood, the AG’s office said. The body of a woman who had been shot several times was found in a street in the Fray Garcia San Francisco neighborhood. 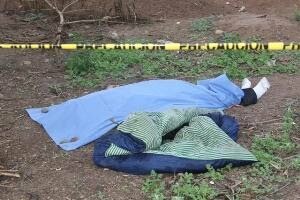 The body of an unidentified man, whose head was wrapped with a trash bag, was found in the Senderos del Sol neighborhood. Warning: Graphic content, discretion is advised! The Narco Messages have been around for a long time, or at least as long as I can remember. It started with simple messages, sentence or two getting to the point. It later moved to Narco Mantas, long messages that where usually hung in highly populated areas. After that, it moved on to Narco Videos, and I'm sorry to keep repeating Narco all the time, I personally don't like it but there really is no other name for it. When I first got a hold of this video I really questioned it, thinking perhaps it's a fake. After analyzing the video for a couple of hours and getting other peoples opinions on it, I came to the conclusion that it must be legit. Couple of things that stood out.. First of all, the lighting in the room, it seems like they perfectly calibrated the lighting so that the only thing that you can see is the body. The camera man never goes out of focus, careful not to reveal anything that he's not supposed to. At the very beginning of the video you can see that the man holding the spiral notebook is wearing a green striped hat with the initials USA. You also see that he is wearing something around his waist, perhaps a sweater? Now this doesn't seem to be your typical sicarios wardrobe. Young and Old, depending on who you ask. College drop out, uneducated but smart. Too passionate for my well being. Mexico says drug cartels are turning to direct attacks on authorities, calls for more US aid. Mexico's drug cartels have changed tactics and are turning more attacks on authorities, rather than focusing their fire on rivals gangs, the country's top security official said Sunday. Interior Secretary Fernandez Gomez-Mont said at a news conference that two back-to-back, bloody ambushes of government convoys — both blamed on cartels — represent a new tactic. "In the last few weeks the dynamics of the violence have changed. The criminals have decided to directly confront and attack the authorities," Gomez-Mont said. "They are trying to direct their fire power at what they fear most at this moment, which is the authorities," he said. Officials here have long said that more than 90 percent of the death toll in Mexico's wave of drug violence — which has claimed more than 22,700 lives since a government crackdown began in December 2006 — are victims of disputes between rival gangs. Mexican drug gangs have been known to target security officials. The nation's acting federal police chief was shot dead in May 2008 in an attack attributed to drug traffickers lashing back at President Felipe Calderon's offensive against organized crime. 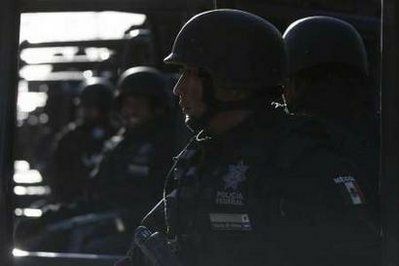 Mexican police arrested five suspects in the killings of seven police officers and a bystander in the border city of Ciudad Juarez, authorities said Monday. Ciudad Juarez, Chihuahua - Mexican police arrested five suspects in the killings of seven police officers and a bystander in the border city of Ciudad Juarez, authorities said Monday. 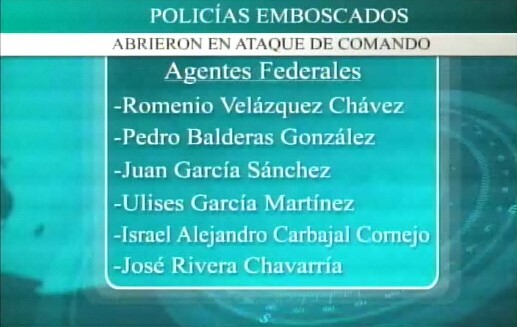 The sicarios arrested were identified as: Antonio Espinoza Reveles, Germán Isau Ozorno Manuel, Daniel Escobar Bonilla, Gerardo Torres Estrada and José Luis Hernández Montañéz. 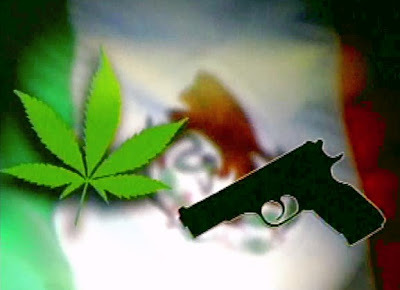 The suspects are members of La Linea gang, the enforcement arm of the Juarez drug cartel, according to a statement from a joint anti-crime task force in Chihuahua state. The men confessed to Friday's ambush of two police patrol trucks as they were flagged down for help by an unidentified man, the federal, state and local task force said. Six federal police officers and one local police woman were killed. The suspects also confessed to 36 other slayings since 2009 and to extorting money from at least 21 businesses, the task force said. Ciudad Juarez, Chihuahua - The ambush Friday in Juárez in which eight people were killed -- including six federal agents and a police officer -- may signal a new wave of intimidation against authorities, officials and experts said Saturday. The attack, carried out in broad daylight by a group of hit men, solidified the resolve of Mexican federal police to fight back even though it was one of the deadliest attacks on authorities in the city since President Felipe Calderón launched the war on drug cartels. Juárez officials said that the ambush will not deter them and that they will not be intimidated by the calculated and ruthless attack. "They want to intimidate us. But now we are going to double our efforts to fight them," said José Salinas, spokesman for the federal police in Mexico City. As a result of the ambush, he said, a new strategy will be used to "avoid similar ambushes." "We will fight them," he said. He did not elaborate on the new strategy. Salinas said the attack on the agents was an act of desperation because authorities are winning the overall war. He also said the contingent of about 5,000 federal police agents will remain in the city indefinitely and will continue to pressure the criminals. This is the newest video in the series of CDG interrogation videos. On the previous video I covered, the identity of the captors was unknown, until a lot of people started claiming that the man behind the voice in the video was none other than Comandante R1 (Major R1) who is a high ranking officer in the CDG cartel. This man has been around for a long time and even has corridos to his name. First question in my mind on the previous video was, why if the captives claim that they gave in to the military forces, how did they end up in the hands of the CDG? Intriguing question if you ask me. The voice behind the video is the same voice behind the previous video "The Sad Reality Of Los Zetas", but if that wasn't enough the second soldier from left to right seems to resemble the "Small Helmet Soldier" who appears in the previous video as well. The helmet he is using seems to be to small for his head, which makes it stand out. Well here for you guys once again, I provide you with the dialogue of the video translated in English. "Well, this time we do this for Mexico to see what the group "Zetas" are. They stopped being a group of "Sicarios" and are now a group of terrorists. Here you have some people that they use to harm the society. How? By throwing grenades at the people, at the mayor's offices, and at women and children. Their mission is to cause fear." Relatives worry about loved ones' fates amid Mexico violence. 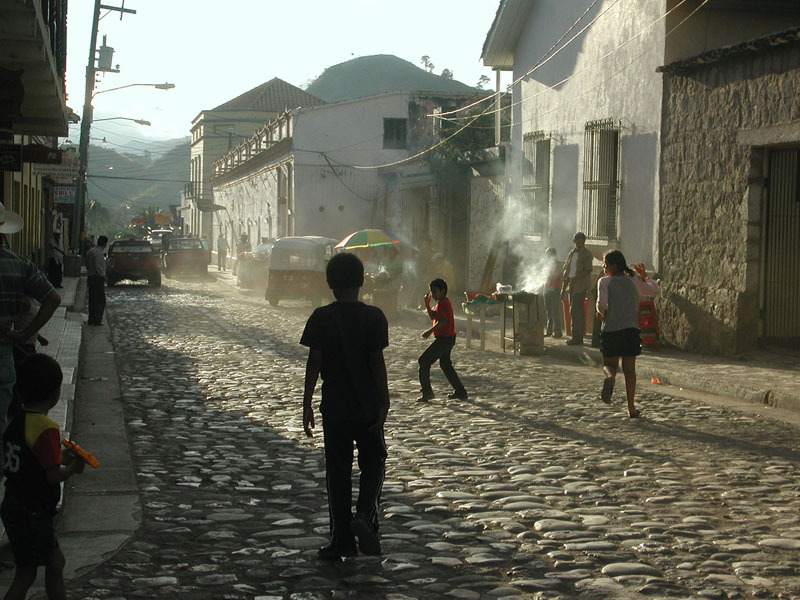 Mexico’s drug war has hit home for some people north of the Rio Grande. Relatives of missing residents in northern Tamaulipas rely on little more than scant news reports for information about their loved ones. Police and military officials in border communities south of the Rio Grande remain virtually unreachable over the phone, while Americans say authorities there seem to dismiss pleas for help in locating missing people. A surge in drug violence has left dozens of Mexicans dead along the Texas border in recent weeks. Brazen attacks by masked gunmen have become a part of life for many. Raw images of violence posted via social media show bodies splayed across bloody streets. Confusion reigns in northern Tamaulipas, where information about killings is hushed amid a media blackout and authorities remain notoriously tight-lipped about incidents of violence. The violence has been attributed to a three-way war among the area’s two dominant drug trafficking organizations and the federal government. The Zetas — a paramilitary organization founded by former members of Mexico’s special forces — have historically served as the enforcement arm of the Gulf Cartel. But in recent years, their operations have grown more independent to the point that they are now fighting with their old bosses for control of Tamaulipas’ valuable smuggling routes. 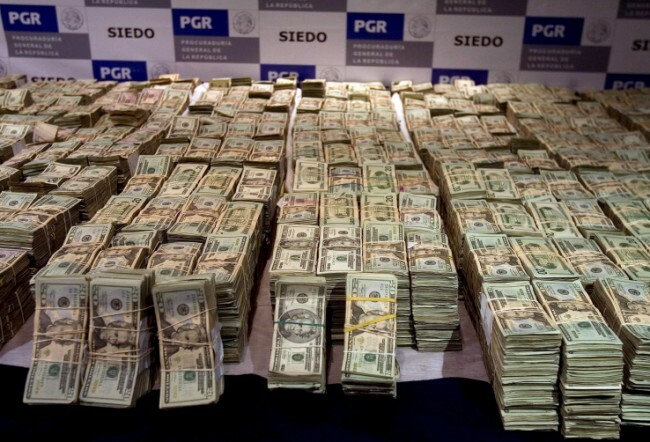 More Mexican drug lords are getting stiff prison terms, but they're quickly replaced. Using drug and racketeering statutes and extradition agreements, federal prosecutors are sending a steady parade of Mexican drug lords into U.S. prisons. Although that is having a chilling effect on the smuggling cartels, there is no sign that the convictions are breaking the organizations, which are growing more violent, according to U.S. officials and other experts. Ten cartel leaders from Mexico have been convicted in U.S. courts in the last two years, while three in Chicago and a fourth in Brooklyn, N.Y., have been indicted in major drug racketeering operations involving tons of heroin, cocaine and marijuana. In the last few weeks in San Diego alone, four cartel figures were convicted of leading organizations that smuggled tons of the drugs into the U.S., carried out assassinations and spent millions of dollars bribing Mexican authorities. The men were given sentences ranging from 30 years to life in prison with no chance of parole. It was hoped that the prospect of U.S. prison time would begin deterring drug violence along the border. U.S. officials say it is having some effect, citing drug lords still at large who admit to being frightened at the prospect of extradition to the U.S. They also say the tactic disrupts the cartels' activities. But authorities on both sides of the border acknowledge that the cartels have simply promoted lieutenants to the vacant leadership positions and that the violence, especially in the last two years, has turned uglier — in the streets and within the cartels, where junior members are fighting one another for control. Cyber Space - The Internet is playing a growing role in Mexico's drug war, spreading both information and fear, at a time when many journalists have been scared into silence. Drug gangs have long used warnings scrawled on sheets pinned up on bridges, or even gruesome beheadings to sow fear, but the Internet, and mobile phones, have taken their messages to a wider audience. Cuernavaca, a popular weekend retreat outside Mexico City, saw restaurants and bars shuttered this month after rumors of a curfew imposed by a drug gang spread by email and across social networking sites. "It spread very quickly through the population, generating panic, fear and doubts," Morelos state government secretary Oscar Sergio Hernandez told AFP. Local officials contacted the business community, union leaders and school directors in an effort to bring calm to Cuernavaca, known as the "City of the Eternal Spring." But although no deaths were reported during that weekend and it's still unclear who started the rumors, the streets remained empty. 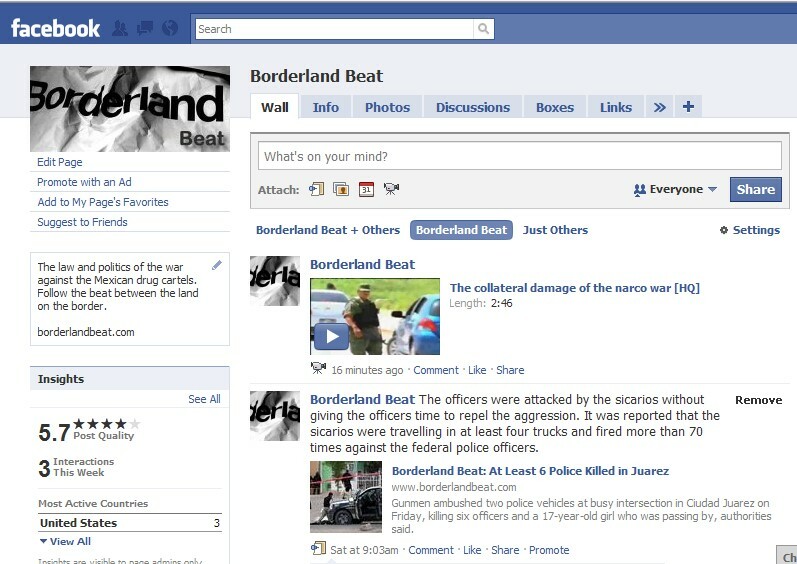 The following Monday, officials set up a team to monitor Internet traffic on sites that included Twitter, Facebook, YouTube and other blogs like Borderlandbeat.com. More than 22,700 people have died in suspected drug attacks since the end of 2006, as violence has increased alongside a military crackdown on organized crime. Northeastern Border States - At least 20 people died in drug-related violence across Mexico, where an international border crossing was closed for several hours after gunmen attacked it, officials said. Shootouts in the northern state of Nuevo Leon left at least 10 people, the majority of them suspected gunmen, dead. The first shootout occurred at 4:35 a.m. Saturday in San Nicolas, a city in the Monterrey metropolitan area, leaving one gunman dead and another under arrest, the army said. Soldiers and gunmen engaged in another shootout about two hours later in the city of Juarez, where five gunmen were killed. A man was gunned down at 6:30 p.m. near a gas station in the city of Guadalupe by a hit squad that fired at him from a moving vehicle. Soldiers engaged a group of gunmen a few minutes later at kilometer 117 of the Monterrey-Reynosa highway, leaving three criminals dead, military spokesmen said. Criminals used stolen buses to block streets Saturday evening in Monterrey, the capital of Nuevo Leon, causing traffic jams and preventing the security forces from responding to attacks. In neighboring Tamaulipas state, meanwhile, at least seven people died Saturday in shootings, an international border crossing was closed for several hours following an attack and two businesses were burned, officials said. The most serious incidents occurred in the city of Camargo, where three bullet-riddled bodies were found, the Tamaulipas state information office, known as the CIO, said. 15 Suspected Drug Cartel Enforcers Captured in Mexico. Amacuzac, Morelos - Fifteen individuals suspected of working as hit men for fugitive drug lord Edgar Valdez Villarreal were arrested after a gun battle with Mexican police, the federal Public Safety Secretariat, or SSP, said. The clash – in which no one was wounded – occurred Friday in the central town of Amacuzac, Morelos state. That state has been hit by a wave of violence in recent months, including the killing of drug kingpin Arturo Beltran Leyva last December in a shootout with marines in Cuernavaca, Morelos’s capital and main bastion of the Beltran Leyva criminal organization. Here is a letter that surfaced 1-2 weeks ago signed C.D.G. I was sitting on this letter for a while because of how it was written, but decided to post it after a conversation I had with a friend who told me "Ya dieron luz verde en Tamaulipas de matar Zetas otraves", They just gave the green light to kill Zetas in Tamaulipas again. It was strange to hear that because I had not heard of any sort of treaty, but according to what I was told there had been attempts on restoring peace between the organizations, but apparently it was not working out so they called it off. I had to change some of the wording in order for it to make sense, but here it is for those who want to read it. Citizens of Tampico, don't be afraid, we only protect your wellbeing. We take care of the "Plaza". We are people who come prepared, we are not young men, we don't kill women, we respect them. Citizens, don't be afraid, Don't listen to gossip, we don't attack people who are not involved in this. Don't be afraid, The Zetas want to scare you, the Marines are not coming for us. It is against the Zetas. This weekend respect the curfew; today, tomorrow and the day after starting from 12am on Saturday and Sunday starting at 9pm don't go out. We have orders of defending this "Plaza" from all enemies. We are not responsible of where the gunfights may breakout. Gunmen armed with assault rifles and grenades attacked a convoy carrying the top security official of the western state of Michoacan on Saturday, leaving four dead and 10 wounded in the second brazen ambush in as many days. Public Safety Secretary Minerva Bautista was recovering from non-life-threatening wounds, said an official of the state attorney general's office who was not authorized to be quoted by name. Bautista was travelling in a bullet-resistant sport utility vehicle. The dead included two of her bodyguards and two bystanders. Of the nine people wounded in addition to Bautista, five were bystanders — including two girls ages 2 and 12 — and four were part of Bautista's security detail. There was no immediate information on the identity of the attackers, who numbered about 20, or on a possible motive. However, drug violence is common in Michoacan, the home base of La Familia cartel. Bautista was returning from the inauguration of a fair when her three-vehicle convoy was blocked just after midnight by a truck the attackers apparently used to block the road. As I reflect on my troubled country, the lyrics of a Bruce Springsteen song come to mind: "We are far, far away from home. Our home is far, far away from us." And that's how it feels to live in Mexico during these turbulent times: far from democratic normalcy; far from the rule of law; far from home and close to everything that imperils it. Always on the lookout, anxious, suspicious of our own shadow. Invaded by the legitimate fear of walking on the street after dark, taking money out of an ATM, hopping into a cab, being stopped by a corrupt policeman, receiving the call of a kidnapper saying that he has taken your child, losing a son, burying a daughter. 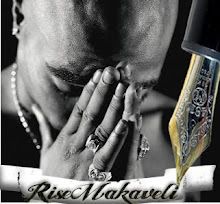 My home has become a place where too many people die, gunned down by a drug-trafficker, or assaulted by a robber, or shot by an ill-trained law enforcement officer or kidnapped and strangled by a member of a criminal gang, as was the case with the teenage children of prominent businessmen Alejandro Martí and Nelson Vargas. At the helm of an increasingly active and visible army, President Felipe Calderón has declared a bold war against drug-trafficking and the organized crime networks it has spawned. In a country where over 6,000 people have died over the last year in drug-related violence, insecurity is top-of-mind for most Mexicans. Given the increasingly lawless conditions of the country he inherited, Calderón had little choice but to act, and he is to be commended for doing so. 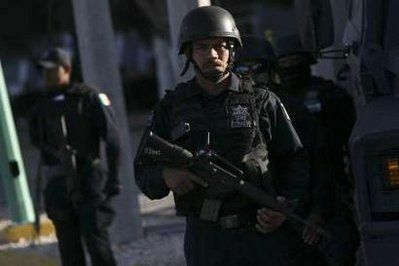 Seven police officers killed in Ciudad Juarez. Ciudad Juarez, Chihuahua - In the Mexican border city of Ciudad Juarez, gunmen ambushed two police vehicles at a busy intersection, killing seven officers and a young man caught in the crossfire. Two more officers were seriously wounded. The ambush was one of the largest fatal attacks on law enforcement officers since a drug war began in the city in 2008. Two municipal police officers embrace after they were ambushed by unknown gunmen in the northern border city of Ciudad Juarez, Mexico, Friday April 23, 2010. At least six federal policemen and one municipal police as well as a young man who was passing by, were killed in the ambush, according to police authorities. Authorities say the officers had stopped to talk to a street vendor Friday who flagged them down for help. Gunmen suddenly opened fire from behind, then fled in three vehicles. The federal agents killed were Romenio Velazquez Chávez, Pedro Balderas González, Juan Garcia Sánchez, Ulises García Martínez, Israel Alejandro Carbajal Cornejo and José Rivera Chavarría. Municipal police spokesman Jacinto Segura said the local officer killed was Ana Gustina Nevares Soto, 22, who joined the force in August. 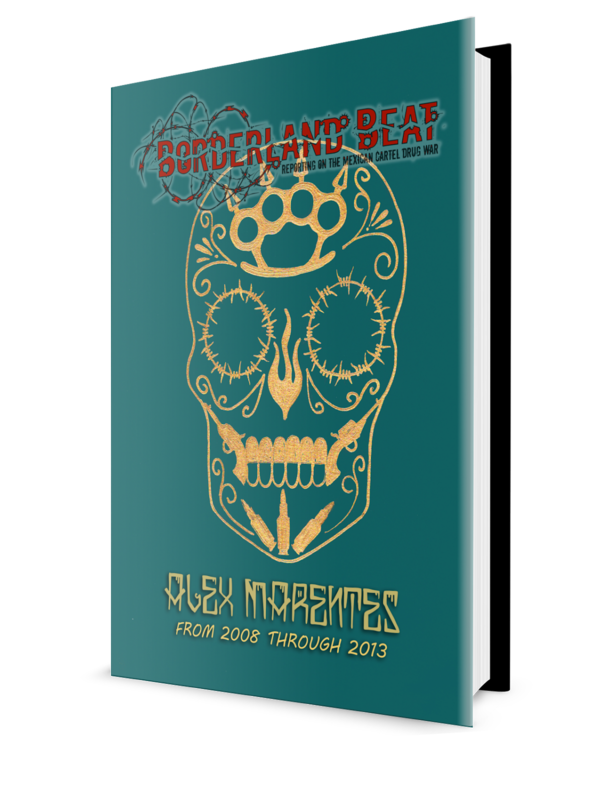 "The Sad Reality Of Los Zetas"
"The Military Killed my Two Boys"
Militarization of Mexico by "Common Citizen"